A Quintessential Costa Rican Experience! 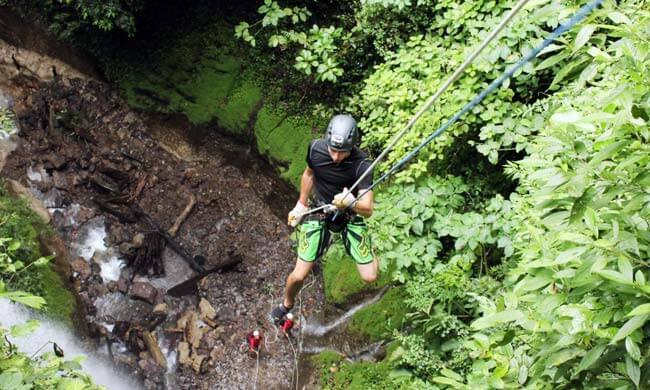 Visiting Arenal Volcano area gives you numerous opportunities to enjoy adrenaline-filled adventures, and the Canyoning Waterfall Rappel tour is definitely high on the list! Travel 30 minutes in a 4×4 along a dirt road and into the quiet, rugged mountainous terrain to begin your canyoneering! When you arrive, your guides will give you a thorough safety talk about important rappelling and down-climbing techniques and will prepare you with a harness, helmet, and gloves. Rappel to the bottom of a 350-foot canyon, and then through three waterfalls and one rock dry face. You may spot wildlife such as monkeys, sloths, and tropical birds along your way while you hike between each rappel point. After completing the rappelling, head back to base camp to shower and change into dry clothes. Then, sit down to a lovely traditional Costa Rican lunch with your guides before heading back to your hotel. A professional photographer will be accompanying you throughout your trip and you can purchase a CD of photos for $25 – a great way to remember your adventure in the rainforest (and perfect for posting on Facebook!). Age limitations: 5+. Moderate physical condition required. This tour is challenging, but you do not need experience. Tour includes: Transportation from/to your hotel, guides, equipment, lunch. What to bring: Fast-drying clothing (surf shorts, outdoor hiking-type synthetic clothes), adventure sandals, tennis shoes or light hiking boots, change of clothes.